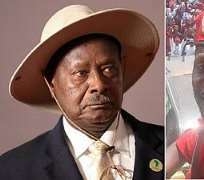 Why M7 Moved Against Bobi Wine? How easy it would be to be called a ‘Doctor’, because all you need is to make good grades, linger in graduate school, then PHD, and bang, you’ re ‘Dr. Robert Kyagulanyi Ssentamu’. One sometimes doesn’t even need to do another degree, you could just move into a PHD straightaway. But this isn’t the case with becoming the president of Uganda. This stuff is seemingly made for the tough ones. One sometimes need foreign back up (as was the case with Idi Amin and Paul Kagame), or luck (as was the case with Museveni Yoweri , Binaisa and Yusuf Lule). Before the Musevenists become doubting Thomases, I want you to know that your guy had literally lost the war in 1985 but the coup by Okello Lutwa gave him a life line. The UNLA became so divided and it became easy for NRA to pound against them. Going back to Hon.Kyagulanyi aka Bobi Wine, I believe, with due respect, that he had this plan in his head, like most dreamers: he will sing a few political songs, dine with politicians, make friends, be a darling musician, stand for MP, build alliances in parliament, attend TV shows, participate in radio debates, help a few win by-elections, e.t.c, and then finally stand for presidency. But things don’t work that way in today’s Uganda. You show any interest in the presidency, you gonna get ‘cooked’ at some stage whether you like it or not. The idea that Bobi attracts large crowds wherever he goes still causes consternation. I remember watching a Mike Mukula documentary on YouTube where he put his riches on display, and he promised to stand against Museveni in NRM. A few months after the documentary, WikiLeaks released a ‘bomb’ on him that he was bad-mouthing Museveni to the Americans. The next thing I read, he had fairly got cases to answer, then Luzira prison. By the time he came out of Luzira prison, he was singing, ‘our man Museveni, tajagenda’. Now, I have got a few theories as of why Museveni has moved against Bobi. First of all, Museveni worked in Obote’s intelligence in 1960s before he later moved against Obote. One thing he learned was never to underestimate anybody in politics. Obote made that mistake after the 1980 elections and he paid a big price. Museveni, on the other hand, is known to be even interested in reading intelligence reports on online activists. He holds critics in contempt, and knows that a leader can grow from something so negligible to anything. His habit of omitting nothing, and taking nothing for granted, leads to some stylistic bumpiness and naivety. So, in his world, it’s better to eliminate the threat at its earliest stage before it gets any bigger. If this is the reason why Bobi is now facing a military court, then we won’t see him out for a while. Secondly, Museveni has always wanted another opposition figure to mitigate Besigye’s popularity. With Bobi in prison and going through exactly what Besigye did, the chances are that Besigye’s support will start going down. This will further divide and confuse the opposition, and therefore work to his advantage in the 2021 presidential elections. Yes, it didn’t work in Arua but the figures were close between the winner, Wadri, and NRM’s Tiperu. If this is the reason he made that move, then Bobi will be out soon, but he will start going through whatever made Besigye endearing to the public: constant arrests, humiliation, in and out of prison, e.t.c. Finally, there is the Muhoozi project theory . A lot of people believe that the first son is being prepared for presidency. I personally don’t believe in this anymore, just like I never believed that Museveni was preparing Amama Mbabazi to take over. I believe that Museveni wishes to die in power. But for arguments sake, if this project is on Museveni’s mind, then Bobi needs a lot of prayers. He will probably be presented with a sweetener while in prison to accept to work as ‘something’ in Museveni's govt. If he declines the offer/s, then he will need more prayers. If he accepts, he will probably end up like Alhajji Ssebagala, Beti Kamya, Bukenya and so many others. All the same, Bobi’s arrest will discourage a lot of youths from being actively involved in politics, or anybody showing an interest in the presidency, and it’s sad.